Kingston offers a wide range of JEDEC standard eMCP components. eMCP integrates eMMC and low power DRAM into one small footprint package. This packaging simplifies system PCB design and speeds time to market. eMCP is an ideal memory solution for applications that require high-capacity storage and low power DRAM combinations, such as smartphones, tablets, wearable devices and car infotainment. 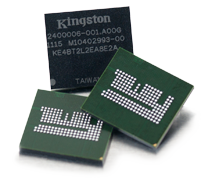 Kingston eMMC is an embedded, non-volatile memory system, comprised of both Flash memory and a Flash memory controller, which simplifies the application interface design and frees the host processor from low-level Flash memory management. eMMC is a popular storage component for many consumer electronic devices, including smartphones, tablets, PDAs, eBook readers, digital cameras and recorders, MP3 and MP4 players, electronic learning products, digital TVs, set-top boxes, Mobile Internet Devices and car infotainment. It is increasingly adopted in many industrial and embedded applications. Small BGA package sizes and low power consumption make eMMC a viable, low-cost memory solution for mobile and other space-constrained products. The technology specifications of eMMC are managed by JEDEC, the global leader in developing open standards for the microelectronics industry. Triple-Level cell (TLC) NAND Flash eMMC has 3-bit per cell and allows for lower overall prices and increased storage capacities. TLC eMMC uses an advanced controller and improved firmware capabilities for improved endurance and reliability. TLC is an ideal memory solution for smartphones, set tip box, OTT box, tablets, smart devices and car infotainment. 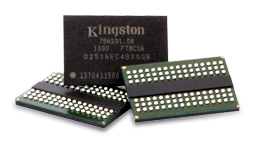 Kingston’s wide-temp eMMC product offers JEDEC eMMC 5.0 features and backward compatibility to previous eMMC standards. It has all of the advantages of standard eMMC and the operating temperature range of the device meets industrial operating temperature requirements (-40°C~85°C), making it an ideal storage solution for harsh outdoor environment applications. i.e. Industrial automation machine, transportation, IP Cam, ext. The Kingston MCP component comes with JEDEC standard ballout. It integrates SLC NAND Flash with LPDRAM inside one small footprint package. Its compact size and low power consumption make it an ideal memory solution for many IoT, wearable applications, digital camera, Gateway and mobile device. MCP with Industrial operating temperature range (-40°C~85°C) is also available. 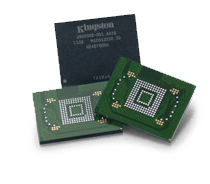 Kingston DRAM components are designed to meet the needs of embedded applications and offer a low voltage option for reduced power consumption.